The panel shows Sienna Brocatelle with styles and rails of Vert Antique. Verde Antico was much used in antiquity and the quarries were lost for some 1,600 years being re-discovered in 1886. Although a breccia, Verd Antique is very strong and often used for monolithic columns, the facade of St. Mark's in Venice contains columns of this marble. Three main varieties are quarried, Light, Moss Green and Dark. 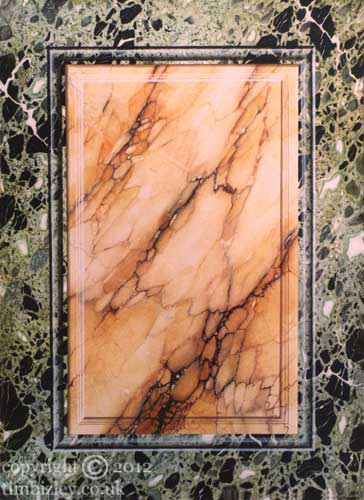 This faux marble trompe l'oeil panel illustrates how paint effects in the hands of the decorative artist offer the opportunity to undertake authentic historic decorative schemes and restoration projects using the same techniques which have been used for several centuries to replicate marble and stone.